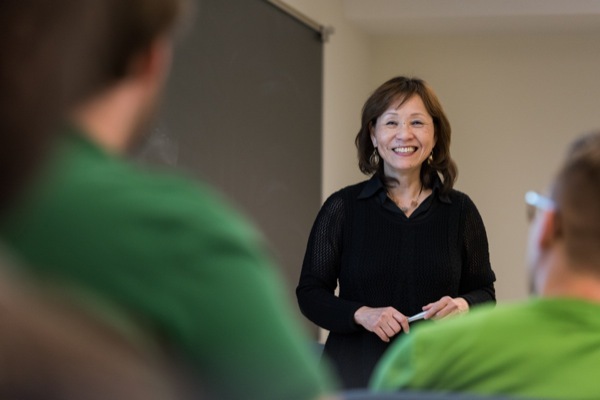 10:47 a.m., Oct. 1, 2015–Cathy Wu, the Edward G. Jefferson Chair of Bioinformatics and Computational Biology at the University of Delaware, has devoted her career to improving how new scientific data generated by the scientific community is stored, organized, indexed, viewed, and analyzed. She’s especially intrigued by proteins, which are important players in biological processes and may be the key that opens the precision medicine door. Wu recently received two major grants to support this work. The first is a $2.8 million renewal grant from the National Institutes of Health (NIH) to further develop the Protein Ontology (PRO), a virtual reference library for proteins developed by Wu and her colleagues. The NIH PRO grant will allow researchers to capture and accurately represent scientific knowledge for ontology mapping – the process of finding connections between concepts – and semantic integration of gene-disease-drug information. The ontological structure to connect the vast and growing amount of biomedical knowledge is critical as researchers expect more and more of computers, in terms of not just their ability to store and search data but also their capability to reason and draw inferences. “This infrastructure will be instrumental in genome-scale knowledge discovery and will aid in improving our understanding of human disease and in identifying potential diagnostic and therapeutic targets,” says Wu, who is also director of the Center for Bioinformatics and Computational Biology at UD. Wu is also part of a team, led by Georgetown University’s Subha Madhavan, that has received $1.4 million from the NIH Big Data to Knowledge (BD2K) Initiative, which is aimed at capturing the opportunities and challenges facing biomedical researchers in accessing, managing, analyzing, and integrating datasets that are increasingly larger, more diverse, and more complex. In collaboration with Vijay Shanker, professor in UD’s Department of Computer and Information Sciences, Wu plans to build an innovative software stack called MACE2K (Molecular and Clinical Extraction) to adapt and extend natural language processing tools to automatically retrieve and pre-process targeted therapy information from the scientific literature and from the government’s clinical trials database. Wu points out that it is not easy to rank cancer drugs for personalized therapy, as there is no clear clinical evidence associating markers with drug response or disease progression, and information is often buried in publications, conference proceedings and clinical trials. Cathy Wu, who joined the UD faculty in 2009, is a renowned bioinformatics researcher. Since 2001, she has led the Protein Information Resource (PIR), a major bioinformatics resource that supports genomics, proteomics and systems biology research. At UD, she established the Center for Bioinformatics and Computational Biology to promote, coordinate and support interdisciplinary research and education in bioinformatics and computational biology as a cross-campus initiative. Prior to joining UD, Wu was professor of oncology and of biochemistry and molecular biology at the Georgetown University Medical Center. She earned her doctoral degree at Purdue University, has served on several advisory boards for agencies such as the National Institutes of Health and the National Science Foundation, and professional associations such as the Human Proteome Organization and the Association for Computing Machinery.